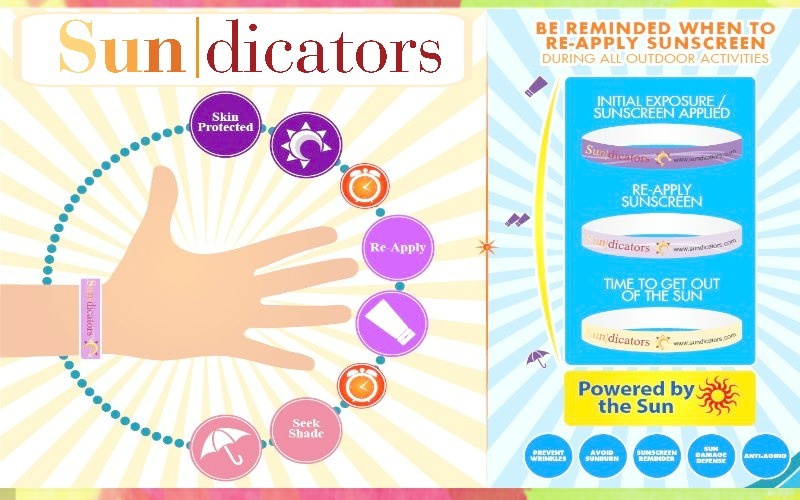 Sundicators UV Wristbands are easy-to-use sunscreen reminders that give you visible cues for when it’s time to reapply sunscreen. Each sunscreen reminding wristband lasts an entire day when used properly. Can be used during all outdoor recreation including swimming activities. Prolonged sun exposure can cause sunburn, sun damage, premature aging, sun spots and more life threatening issues like skin cancer and deadly Melanoma. Once wrapped around the wearer’s wrist, he or she then applies sunscreen to both themselves and the Sundicators Wristband before engaging in outdoor activities. Sundicators will change colors to let the wearer know when it’s time to either re-apply sunscreen or get out of the sun. With Sundicators you’ll enjoy worry-free fun in the sun! Follow these simple steps to have a sun safe day! Activate your Sundicators by exposing it to direct sunlight; the wristband will turn a dark purple. Apply sunscreen with an SPF 15 or higher to both the Sundicators and your skin. As time passes and your sunscreen loses its effectiveness, your Sundicators Wristband will start to fade. Reapply more sunscreen to all exposed parts of the body (or seek shade). Please follow the directions on your sunscreen packaging when using your Sundicators. If you have skin condition such as Albinism, Vitiligo, Lupis or other sun sensitivities from medications or skin care products, please seek the advice of a medical professional. Swimming and perspiring while outdoors will greatly reduce the effectiveness of sunscreen. Reapply more often. Sundicators are not a medical device or toy. Using Sundicators does not replace sunscreen. Using Sundicators does not replace the need to use sunscreen as directed. See Sundicators packaging for more information.